The closest hill station to Mumbai, Matheran was discovered in 1850 by the British during their occupation of India and subsequently developed into a popular summer retreat. At a height of 800 meters (2,625 feet) above sea level, this serene place provides a cooling escape from searing temperatures. However, the most unique thing about it and what makes it so special is that all vehicles are banned there— even bicycles. It's a soothing place to relax away from any noise and pollution. Matheran is located around 100 kilometers (62 miles) east of Mumbai, in the state of Maharashtra. Getting to Matheran is one of the highlights A popular option is the leisurely two-hour journey on the historic toy train mountain railway from Neral. Services were suspended in May 2016 due to technical problems but started running again on a limited basis in January 2018. If you don't take the toy train up to Matheran, there are a couple of other ways of getting there: take a train from Mumbai to Neral and then shared jeep to Dasturi car park, or drive all the way to Dasturi car park if you have your own vehicle. Dasturi car park is about 3 kilometers (1.8 miles) from Matheran. From there, you can ride to Matheran on horseback, or walk a few minutes to Aman Lodge railway station and take the regular shuttle train service (which operates during the monsoon as well). Hand pulled rickshaws and porters are also available. To get to Neral from Mumbai by train, take one of the frequent local trains that terminate at Karjat or Khopoli on the Central Line. There are also two morning Indian Railways trains that stop at Neral—the 11007 Deccan Express (departs CST at 7.00 a.m. and arrives at 8.25 a.m) and the 11029 Koyna Express (departs CST at 8.40 a.m and arrives at 10.03 a.m). Visitors are charged a "Capitation Tax" to enter Matheran, to be paid on arrival at the toy train station or car park. The cost is 50 rupees for adults and 25 rupees for children. Due to its height, Matheran has a cooler and less humid climate than lower surrounding areas such as Mumbai and Pune. In summer, the temperature reaches a top of 32 degrees Celsius (90 degrees Fahrenheit) while in winter it drops to 15 degrees Celsius (60 degrees Fahrenheit). Heavy monsoon downpours are experienced from June to September. The roads can get very muddy as they're not sealed. As a result, many places close for the monsoon season and the toy train service is suspended. The best time to visit is just after the monsoon, from mid September to mid October, when nature is still lush and green from the rain. 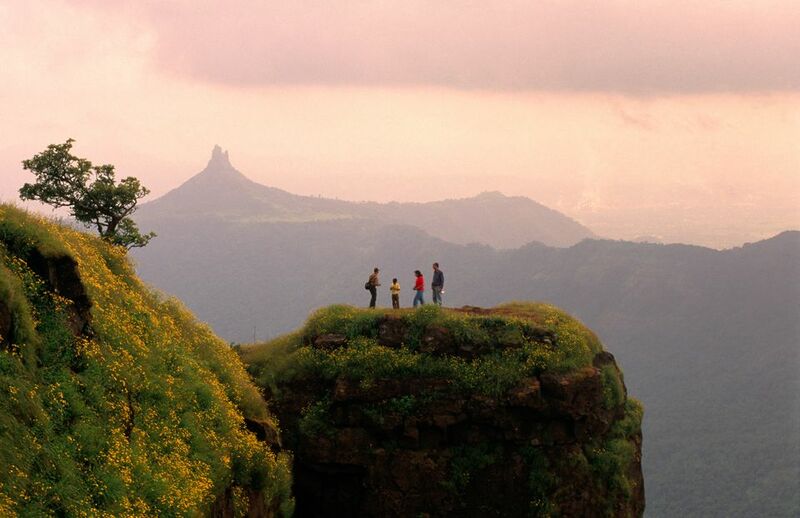 Visitors are drawn to Matheran for its tranquility, fresh air, and old-world charm. In this place without vehicles, horses and hand pulled carts are the main forms of transport. Matheran is also blessed with dense forest, long walking tracks, and panoramic views. There are over 35 large and small viewpoints dotted around the hilltop. Early risers should head to Panorama Point to take in a spectacular sunrise, while fiery sunsets are best seen from Porcupine Point/Sunset Point and Louise Point. Exploring all the points on horseback is a fun adventure. A trek to One Tree Hill is also memorable. Matheran's isolated location makes it relatively expensive to stay there. Cheaper rooms can be found in the main market area near the toy train station, while secluded resorts are set back from the road amid the forest. Some of the grand mansions of the British, Parsis and Bohras have been converted to hotels, which are a highlight. Character-filled Lord's Central is one such place. Rates start from 4,000 rupees per night, with breakfast included. Tax is additional. It's centrally located, and has a stunning mountain and valley views. The 100-year old Parsi Manor is a magnificent heritage property with four bedrooms, perfect for groups. Verandah in the Forest is perhaps the most popular heritage hotel in Matheran. Rates start from about 6,000 rupees per night, including breakfast. Westend Hotel has a peaceful location away from the main market area, with rates from around 3,000 rupees per night. Woodlands Hotel is also a good choice, but can get busy with families staying there. Very attractive hotel discounts of 50% are possible during the low season, from mid June to mid October. For the best savings, instead of booking ahead, negotiate directly with hotel owners when you arrive. If you want a relaxing experience, avoid visiting Matheran during the Diwali festival in October or November, Christmas, and the Indian school holiday period from April to June. Prices skyrocket as hordes of tourists flock there. Weekends can also get hectic. Meals are usually included in hotel rates so do check what's being served—some places only cater for vegetarians. Feeling frazzled, I visited Matheran on a three-day break from Mumbai with the objective of getting some peace and quite among nature. It was the week before Diwali, so I was also hoping to beat the crowds and get some decent discounts. I'm happy to say that all this was possible, and I returned home completely rested and refreshed. To get there, I caught the Koyna Express from Mumbai. However, it was running late and arrived in Neral only a few minutes before the toy train was about to depart (which is a common problem due to the schedule). I hadn't booked for the toy train as it wasn't peak season, but still all the second class seats were taken. Fortunately, I managed to grab one of the last remaining spaces in the first class carriage. Finding somewhere to stay away from the noisy vacationing families proved to be a little more difficult than expected. Hotels offering good discounts, such as the Horseland Hotel and Mountain Spa, were also offering karaoke, children's activities, and other entertainment programs. Great for families but not people in search of solitude! Finally, I settled on a rambling property which hinted of the British Raj era, called the Anand Ritz. While it would normally be way overpriced, the discount being offered made it acceptable enough. Best of all it was quiet. (However, standards have since declined dramatically and it's no longer recommended). I spent my time in Matheran walking and horse riding, enjoying the nature trails and views, and fending off cheeky monkeys who wanted to feast on my food. It felt like being on top of the world, and a complete world away from the constant hustle and bustle of Mumbai. One thing to keep in mind when visiting Matheran is that the area subject to frequent power outages. Many places don't have a generator to supply backup power, therefore it's a good idea to carry flashlight.